Recently released data by Standard and Poor’s (S&P) and Case-Shiller indicates that its measure of house prices, the House Price Index – National, rose by 6% on a year-over-year not seasonally adjusted basis. This is the 26th consecutive month of year-over-year increases in the house price index. This index was recently converted from a quarterly frequency to a monthly one. Over this period of more than two years, house prices have risen by 20%. Despite a slight decline of 0.1% on a seasonally adjusted basis over the month of June 2014, the S&P/Case-Shiller House Price Index is now at its February 2005 level. 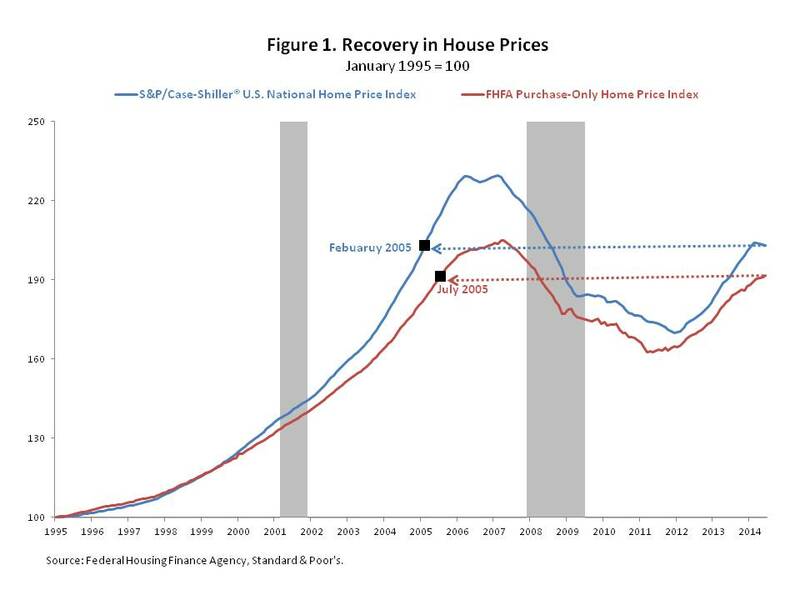 Similarly, the recent release by the Federal Housing Finance Agency (FHFA) indicates that its measure of house prices, House Price Index – Purchase Only, rose by 5% on a 12-month not seasonally adjusted basis in June 2014. This marks the 29th consecutive month of year-over-year growth. During this period, house prices have risen by 21% and on a seasonally adjusted basis according to Figure 1, have now returned to their July 2005 level. A previous post illustrated that rising house prices are contributing to an expansion in housing equity, the largest source of wealth on the balance sheet of the average household. However, a smaller portion of households own and occupy a house. According to Figure 2, house prices, measured by S&P/Case-Shiller House Price Index – National have risen by 13% between 2012 and the first half of 2014, 1% in 2012, 10% in 2013 and 2% over the first half of 2014, but the share of households that own and occupy a house, the homeownership rate, has fallen by 1.4 percentage points over this same period, 0.7 in 2012, 0.3 in 2013, and 0.4 over the first half of 2014. In earlier years, house price appreciation and homeownership tended to move in parallel. As Figure 2 shows, over the 10-year period spanning 1995 and 2004, both house prices and the homeownership rate increased in each year. 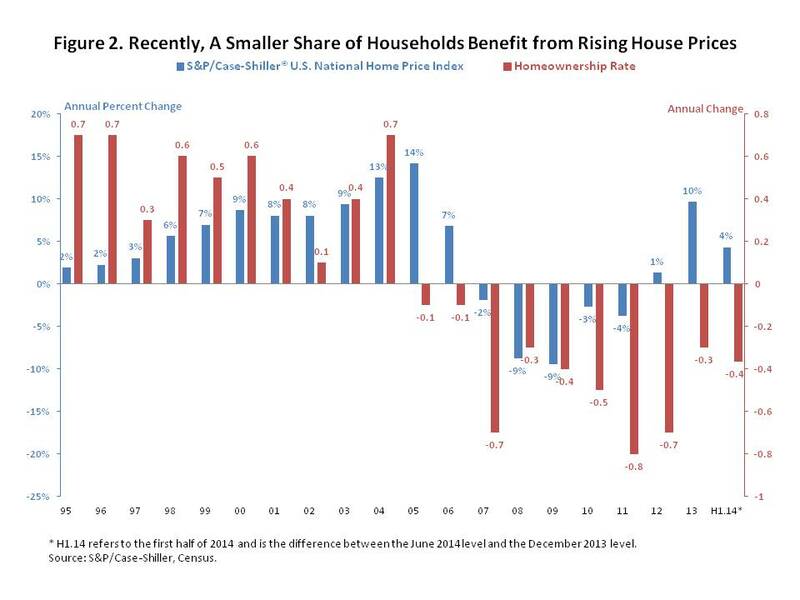 Similarly, both house prices and the homeownership rate declined in each year between 2007 and 2011. However, in 2005 and 2006, house prices rose even though the homeownership rate fell, albeit slightly. This divergence likely reflected the different speeds of response to the excesses of the housing boom. Going forward, NAHB expects home-buying to rise as housing demand, pent-up over the past few years, is released.